6 of the Best Groveland, CA, Restaurants, that You Need to Try! Vacations to Yosemite are truly inspirational, but don’t spend all your time in this one area! There are numerous smaller towns surrounding this scenic spot that area also worth a visit, such as this historic town of Groveland, CA. Containing intriguing attractions and enjoyable activities, this destination is one you’ll never forget. One of the best parts this town is the many Groveland, CA, restaurants! Check out the list below to treat yourself to some of the finest dining you’ve ever experienced. With an extraordinary chef who was studied and cooked all over the globe, Fork and Love Restaurant features some of the most delectable dishes ever. Try a variety of locally sourced foods while you’re here, paired with an excellent local beer or glass of wine! With an elegant dining room and cozy atmosphere, you’ll love everything about this fantastic place to eat. Take a peek into the fascinating Groveland, CA, history when you step inside the Iron Door Saloon! The oldest drinking establishment in California that is still booming today, this historic restaurant dates all the way back to 1852. In addition to enjoying some delicious food, you’ll also be able to observe numerous antique artifacts and photographs in this must-see spot in Groveland, CA. Do you appreciate a good, steaming cup of joe? Make sure to stop by Mountain Sage during your stay in Groveland, CA! Not only does this unique place offer some of the best coffee you’ve ever tasted, but they also create some truly delicious meals that you have to try, such as quiche, breakfast burritos, and fresh baked treats. Admire the amazing artworks and browse their beautiful gardens while you’re here! Chow down on a hearty, home-cooked meal when you visit the Priest Station Cafe! Their grass-fed beef burgers are sure to satisfy even the hungriest appetite; enjoy one of these or a sandwich or steak while gazing at the stunning views out the window. Have a blast by engaging in the many activities offered at Pine Mountain Lake before ending your day with a delicious meal! The Grill at Pine Mountain Lake provides amazing American cuisine to delight your taste buds after a day of golf, swimming, and hiking around this area. If a hot, cheesy pizza is what you’re craving, Two Guys Pizza Pies is the place for you! With a wide variety of toppings as well as a selection of salads, sandwiches, and calzones, this restaurant has everything you need for a scrumptious, filling meal. Make sure you order some of their mouthwatering breadsticks! Come Stay with Us in Hotel Charlotte! If you’re looking for the best Groveland, CA, hotels during your California getaway, Hotel Charlotte is the ideal selection! Not only does our wonderful bed and breakfast contain luxurious rooms and the divine Fork and Love Restaurant, but we also have several vacation rentals you can stay in as well. You’ll love the comfortable and relaxing environment we have to offer, as well as the numerous nearby attractions and activities. 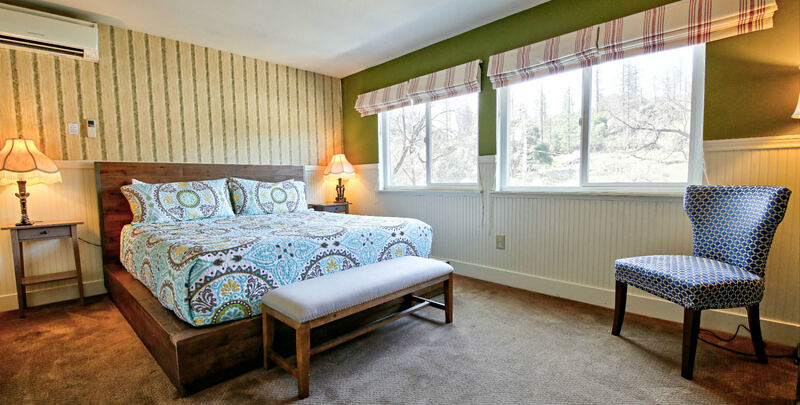 Don’t wait a moment longer; check our availability today to start planning your dream vacation to Groveland, CA! To learn more about the many fun things to do in Groveland, CA, download our free Vacation Guide!